Over the years I have had the good fortune to learn from master luthiers, skilled woodworkers, excellent guitar technicians, an electrical engineer and much much literature. I believe in sharing what I have learned just as others have shared with me. If you are interested in learning how to work with your own guitar, to modify or repair your guitar, or build a new one from scratch I would be happy to mentor you through the process. These are new courses I am offering in my workshop for people who would like to perform and understand their own electric or acoustic guitars and their set ups better. Theoretical and practical information provided, demonstration and hands on experience. You will leave with your guitar professionally set up...by you! All tools provided. Students need to supply their own guitars and a new set of strings. Class size limited to 3 per session. Sessions are all day, 9:30-4 (with breaks). $350 + taxes non-refundable to book your spot. I offer mentoring in a one-on-one situation where you can choose to get as much or as little guidance as you need or prefer to tackle your own custom project at your own pace. Projects can range from new construction of a guitar (acoustic, electric etc...) to customizations and restorations. Please contact Nicole to inquire. 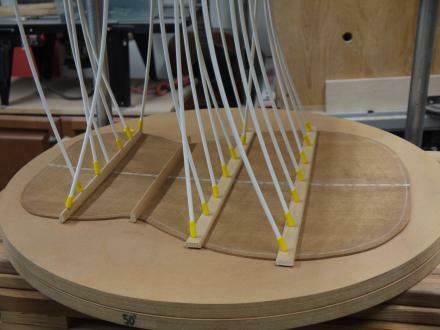 "Prior to the course, I was intimidated in changing my strings! My guitar sounds amazing, the playability has improved and my knowledge about what makes my guitar actually work has increased dramatically. She has given me to confidence to dive in to fix up a couple of older guitars I have. Nicole, thanks for adding another dimension to a hobby I love!"